I love dolphins and we see them a lot here in Southwest Florida. We see them when we are at the beach and when we are boating. Packs of them (or ‘pods’ if you want to get technical). They are very social animals and very often swim right next to our boat and on occasion even play in the boat’s wake. They are amazing creatures and I still think it is so cool every time we see some. I have been lucky enough to have swam with dolphins too. Once by myself, and twice with my boys. It is a really awesome experience. Anyway, I made this little sea glass dolphin over the weekend. 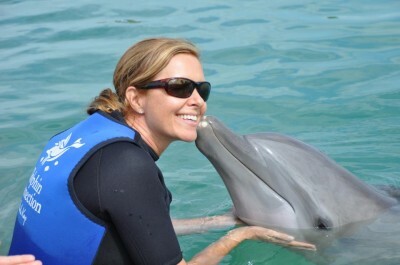 Below is how I did it….but first check me out getting a smooch from my dolphin friend. March 2012, Hawks Cay Resort, Islamorada, Florida. 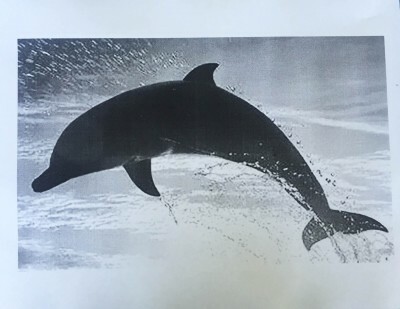 To begin, I found the perfect dolphin image online and saved it. Then I enlarged the image to the size I needed in Photoshop, and printed it out. 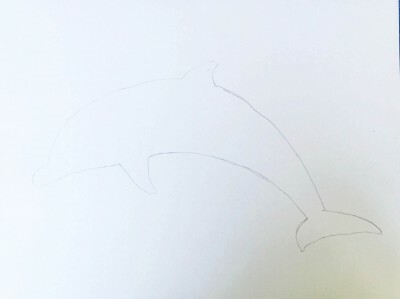 Next, I traced the image onto a standard size 8.5 x 11 but very thick piece of stock paper which would end up in the shadow box. 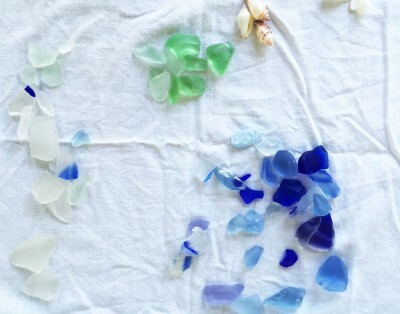 I dumped out all the sea glass I could find in all the vases and various places around my house. I have lots of it. I organized it by color. 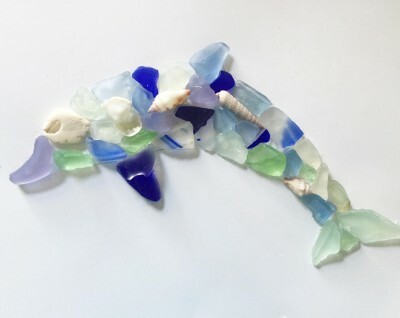 I have lots of shells too, most of which were collected on the beaches here in Naples, so I made a pile of shells too. 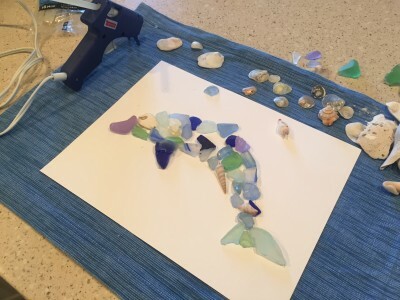 If you don’t have sea glass laying around like I did, you can pick some up here or at most craft stores. 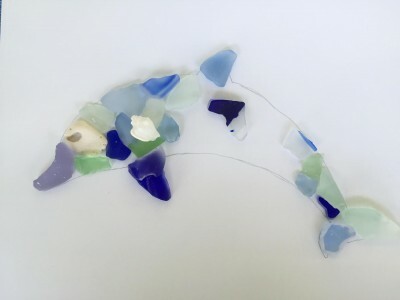 Then I began to place the sea glass into the dolphin shape. This took a while to get everything to look right. It was sorta fun, like doing a puzzle. 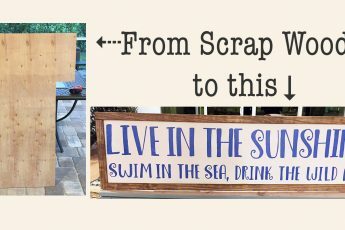 Once I had everything where I wanted it, I fired up the old hot glue gun and went to town. This took a long time as I ended up moving things around quite a bit, but I was happy with the way it turned out. 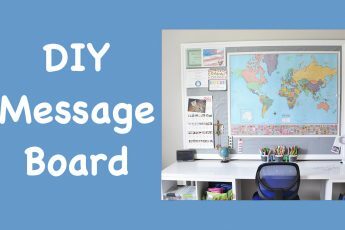 Oh, and don’t forget to erase your pencil marks as you are gluing so they won’t be visible. Gluing things down and moving them around. 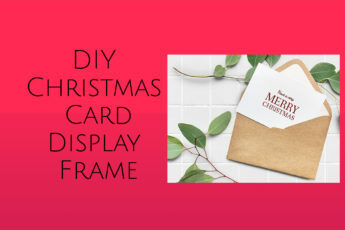 Put it in your shadow box and hang it up! All framed and ready to hang. 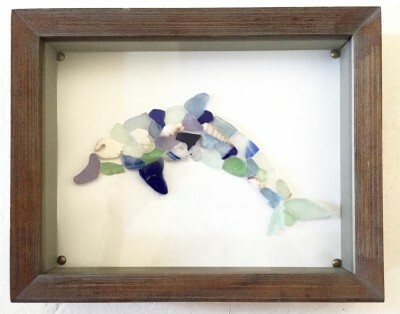 Hope you liked my Sea Glass Dolphin DIY project. It was so easy, even I could do it!